Section 2.0 High Frequency Sine Wave Oscillators. • Frequency Control in RF Oscillators. Section 2.1 The Hartley Oscillator. • The Tuned Tank Circuit. • Automatic (Sliding) Class C Bias. • How the Hartley Oscillator Works. Section 2.2 Hartley Oscillator Practical Project. • Building a Hartley Oscillator. • Hartley Oscillator Tests & Measurements. Section 2.3 The Colpitts Oscillator. • Using a Common Base Amplifier. 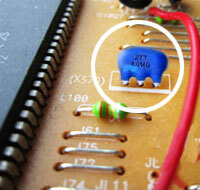 • Using a Common Emitter Amplifier. Section 2.4 Colpitts Oscillator Practical Project. • Building a Colpitts Oscillator. • Colpitts Oscillator Tests & Measurements. • Frequency control in LC Oscillators. • Test your knowledge of LC Oscillators. There are many different designs of sine wave oscillators used in radio and communication equipment, usually using some form of resonant circuit to generate signals at radio frequencies from several tens of kHz to 1GHz and above. A number of popular oscillator designs date back to the early 20th century when radio communication was being developed, and it has been the custom to name the various types of oscillator after their inventor. Any one particular design of oscillator can have several different forms, and each type of oscillator has certain advantages and disadvantages for any particular application. This module describes some popular types of LC and crystal sine wave oscillators, how they work and includes some practical projects showing how to build and test some RF oscillators. 1. LC Network, 2. Quartz Crystal, 3. Ceramic Resonator. In networks, consisting of an inductors and capacitors the frequency of oscillation is inversely related to the values of L and C. (the higher the frequency, the smaller the values of L and C). 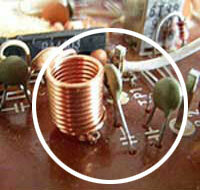 LC oscillators generate a very good shape of sine wave and have quite good frequency stability. 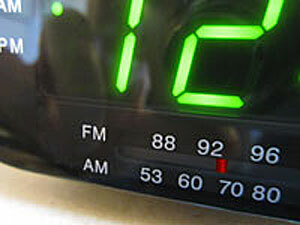 That is, the frequency does not change very much for changes in D.C. supply voltage or in ambient temperature. LC oscillators are extensively used for generating R.F. signals where good wave shape and reasonable frequency stability is required but is NOT of prime importance. Crystal oscillators are used to generate both square and sine waves at frequencies around 1 or 2 MHz and higher, when a very high degree of frequency stability is needed. The component determining the frequency of oscillation is thin slice of crystaline quartz (Silicon Dioxide), usually sealed inside a metal can. The quartz crystal vibrates mechanically at a very precise frequency when subjected to an alternating voltage. The frequency depends on the physical dimensions of the slice and the angle at which the slice is cut in relation to the atomic structure of the crystal, and so once the crystal has been manufactured to specific dimensions, its frequency is extremely accurate, and constant. The frequency produced is typically accurate to around 0.001% of its design frequency and is almost wholly independent of changes in supply voltage and variations in temperature over its working range. Where even greater accuracy is required, the crystal may be mounted in a small, heated and temperature controlled enclosure. Crystals are manufactured in a wide range of specific frequencies. Sine wave crystal oscillators are commonly used to generate very accurate frequency carrier waves in radio and other communications transmitters. These components work in a similar way to quartz crystals, they vibrate when subjected to an AC signal, but are manufactured from a variety of ceramic materials. Thay are generally cheaper and physically smaller than equivalent quartz crystal resonators, but do not have such a high degreee of accuracy. 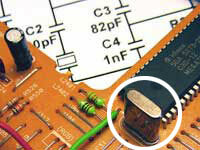 They can be manufactured in either surface mount or through hole versions having either two or three connections.